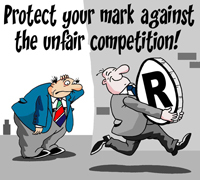 NEOMARK Ltd. is a Trademark agency dedicated to provide a wide range of Trademark services in Canada and Europe, including Central and Eastern Europe and Balkans - from the prosecution of applications to unfair competition resolution. We work with various Trademark matters offering our Canadian and foreign clients the ability to efficiently and cost-effectively gain their Trademark goals. Cooperating with our European associates on a very close basis we have established a successful and reliable business network. The contacts with experienced professionals allow us to deal directly and expeditiously with the local Trademark authorities. We are a group of Intellectual Property specialists whose goal is to provide by cooperative efforts the best professional Trademarks services, which include: searches, registrations, watches, renewals, assignments and mergers, name and address changes, cancellation and opposition actions. Copyright © 2019 Neomark Ltd. Trademark Agency.